We have automated the submission of your business activity statement. Consequently, the submission process is sped up, the risk of errors is minimised, cost is reduced and you will be more likely to meet your compliance obligations. If your business is NOT registered for GST you do not have to submit a BAS return. Of course, if you are not sure if you need to register for GST you should contact your bookkeeper. For new and existing businesses, alike, you should review this video for a refresher/overview of the GST process. Depending on your circumstances, your business activity statement needs to be submitted either monthly, quarterly or annually. You can find the due dates for your business activity statement here. Your bookkeeper will make sure that your accounts are up to date and your BAS is prepared prior to the deadline. Due to your BAS being submitted electronically and your use of a registered BAS Agent, you maybe eligible for submission and payment extensions. Consequently, if you ever need an extension please contact us and we will arrange this for you. Reviews your accounts and ensures that they are up to date and accurate. Corresponds with you to locate any missing documents. Click on the draft Activity Statement Report link and do the following:Check that the correct BAS period is selected. If not select the correct period. Review the list of transactions. You should let your bookkeeper know if there is anything out of place, or if you have questions about any of the transactions. G1 (Total Sales) – is this the figure that you expected for the period? W5 (Total withheld) – this is the amount that you have withheld from employees and others during the period. Do this figure look correct to you? T7 (PAYG Instalment) – this is the amount of income tax that the ATO has estimated you need to pay. If you need to amend this amount, let us know. If your business runs through a Trust there will be nothing shown at T7 because the trust does not pay tax. You do. For more information on how trusts work click here. 9 (Payment) – this is the amount you will be required to pay to the ATO by the due date (see above). Finally, return to the BAS Authority Request email. Using your finger or your mouse sign the BAS Authority. You will then receive a signed copy of the BAS Authority form via email, for your records. Your bookkeeper submits your Business Activity Statement to the Tax Office via Xero. You will then receive an email confirming the submission. It is important that we submit your business activity statement by the due date. However, it is not so critical that you pay the ATO by the due date. If you need more time to pay, let us know so we will make arrangements with the ATO for a payment extension. Not submitting your BAS by the due date will raise a red flag at the ATO. Finally, your bookkeeper adds a bill to Xero for the outstanding amount. You can view your GST bill here. Review this video for an overview of GST in Australia and your obligations. For all payments made, the law states that you must check the validity of your supplier’s ABN. Check that the supplier has provided a valid ABN that belongs to them. 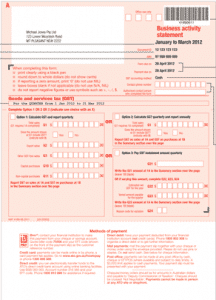 Obtain a valid tax invoice from suppliers. Payments made based on invalid an ABN cannot have the GST claimed back from the ATO. Similarly, if you supplier charges for GST, but is not registered for GST, you cannot claim the GST paid to that supplier. Consequently, it is worth checking each supplier’s ABN. Reports of the ATO conducting reviews of businesses in the areas of supplier registration and validity of GST claims are becoming more and more common. Therefore, you should not ignore this obligation as it will be reviewed in an audit, with potential penalties applied by the ATO if GST has been incorrectly claimed when the Business Owner knew it shouldn’t have been claimed. You can look up and check ABN numbers here. This entry was posted in Bookkeeping, Business Activity Statement, Tax Planning. Bookmark the permalink.